Sup? So I've had no issues with Google Now/Google search until today. About 5 hrs ago I noticed the issue. 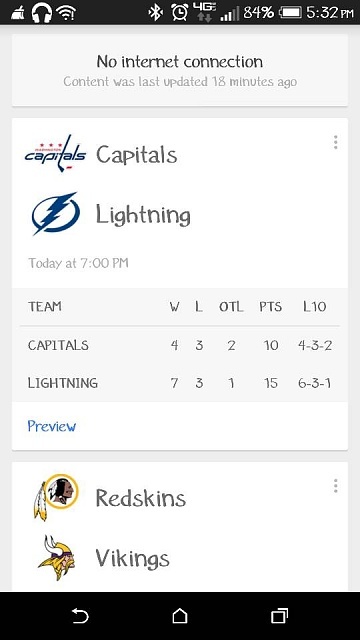 I'm commingly swipe up to launch Google search or Google Now. Well about 2pm it wouldn't open, tried this about 5 times. Then it finally opened. Then froze the whole phone. Then crashed. So I cleared the cache, uninstalled and downloaded again. Still the same issue. Any ideas? I tried my M8, it worked ok.
Haven't tried it yet. A little nervous do so. 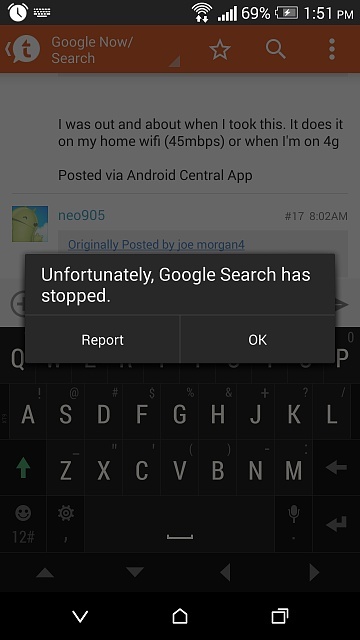 Same here got same problems at the moment...it's there a problem with Google now servers or was it updated recently? So this morning I went ahead and did it. The phone in overall performance seems more shifty/faster. It's really simple to do. Google Now/Search has been flawless so far. Even before I wiped cache partition Google Now/Search worked just ok on wifi. I'm at work today on the 4g LTE(this is when I've had issues) I'm going to give it a day or 2 and report back the overall phone and Google Now/Search performance. Don't be scared it's really simple. Follow the step from above. I was having an issue when I first swiped up on it it would just freeze and then anything associated with Google would not work either. Now everything seems fine. The link there, it explains is advantages of clearing cache partition. Just go ahead and do it use another tablet or phone so you can follow the instructions as you do it so you don't mess up. I do not know what is causing your problem, but I do want to let you know not all M8's are affected. 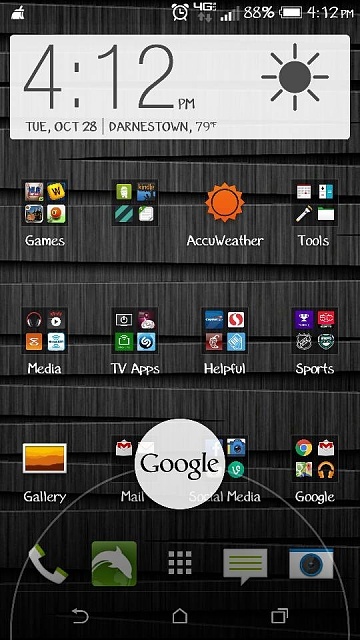 I have the latest updates for Google Now and Android on Verizon. I have mine set to listen for my voice at all times and I use Google Now at least 4 times per day and have the widget on my home screen, so it is still working. Make sure you let us know what resolves your problem. I had the same problems as above. Plus Google Search became the biggest battery hog on my phone. I reverted back to the last version. Much more stable and better on battery. How do I revert to the last version? Your screenshot shows a wi-fi network available--have you tried turning your wi-fi radio off, to see if it might be interfering with your mobile data connection? Or connect to that wi-fi network, then see if Google Now works. Just go into Apps on your phone uninstall Google Search to bring you back to the original version that came with the phone and install the previous version or whatever version you want all the APK's are there. I get this image sometimes when using Google now...I wiped the cache in recovery...I wonder if I there is an app or setting that is making it do this..
Have you tried going to Settings>Apps>All​, selecting Google Search, and Clearing Cache/Data there? Yes. That was the first thing I did before I even read this post. But I just checked on it today and after I refresh everything is fine. As of now it seems to be working perfectly. It's possible that there may have been a server issue that finally cleared up. Hi everyone. I am using HTC One M7 with Lollipop version of Android. My Google App used to crash a lot but I think I have found a workaround to avoid the issue. When the app crashes , clear the data and cache un App settings (stop the App first). 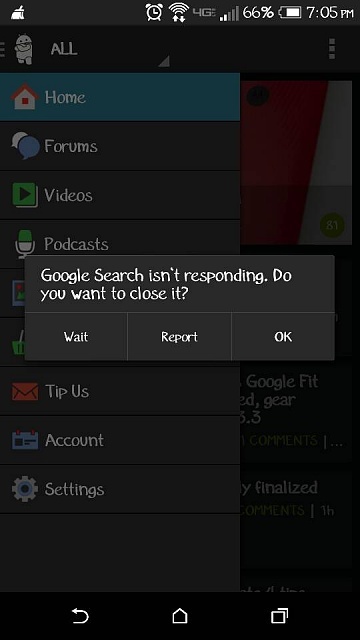 Then, when restarting the app, DON'T set up the app for voice commands. The app isn't crashing for me now with just the one adjustment/sacrifice.